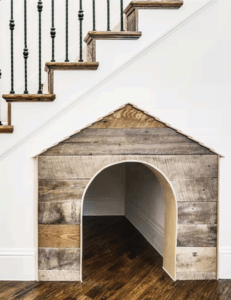 Want to add a little extra space to your home? If you have a stairwell you might be in luck. 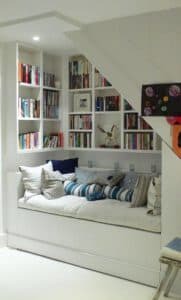 You can remodel the space under your stairs to add extra room to your home and increase its value. How do you know how much room you have? Cut a small hole in your drywall to see how much space you have. If the space looks good, knock out a larger section of the drywall between wall studs. Always check to see if you can remove wall studs as they could be load-bearing walls. After everything is checked out and clear of debris, it is time to start remodeling. Not sure what you want to use in that space? 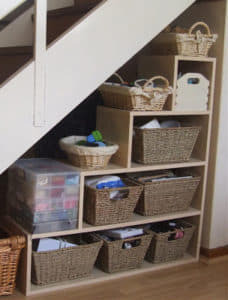 Creating a storage space under the stairs will keep you organized and declutter your home. Add deep shelving so you are able to storage totes, large coolers, and other supplies. Baskets can make a great addition and look good too. You can store board games, craft materials or other smaller valuables. Tired of not having enough space for coats, shoes and other attire? Creating a closet will help get rid of shoes lying around the house. You can install a nice bench to sit on with a hook in the back to hang up coats and other attire. Add some cubby holes under the bench with the addition of baskets to hold shoes, scarfs and more in. You can also install sliding shelving that can serve as a closet or a storage area as well. Are you one to have parties? This remodel might be perfect for you! 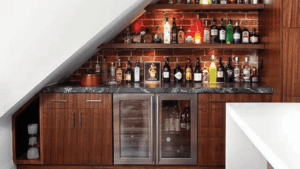 Turn your stairs into a bar or wine cellar. Make sure to install proper electrical outlets for any devices you may need. A mini refrigerator or wine cooler will fit perfectly under the stairwell. Adding additional shelving or cabinets will help to complete the space. Just looking for a little extra space but not wanting to do too many renovations? This is perfect for you, just add some shelving and a few cabinets that will spruce up the space. You will be able to show off family pictures, valuables, and store things out of site. Do you work at home or just need a little office space for yourself? 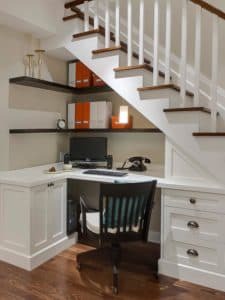 This is a great way to create that perfect little office space you always wanted. Add some additional shelving, drawers, and a space to store your chair under and you will be all set. Need a little extra storage for storing food? 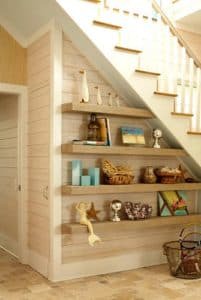 You can turn your space under the stairs into a pantry. 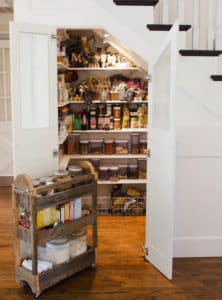 By adding shelving around the interior you can create yourself a walk in pantry. Complete the pantry by adding a door to hide the food from view. The little ones need a place to call their own? 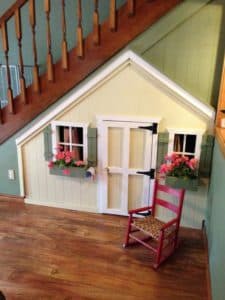 Create the perfect space for them under the stairs by making a playroom. Get toys off your floor by adding shelving inside the playroom to store their playthings. 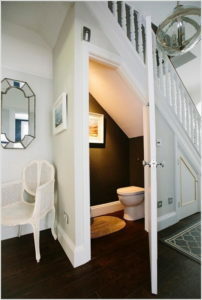 Last but not least you can create a small bathroom. This bathroom will be a great addition to a finished basement for guests to use. Adding a bathroom can also increase the value of your home.